Hickories (genus Carya) are a lot like walnuts (genus Juglans). The leaves are alternately arranged, and pinnately compound.The wood is heavy, hard and strong, well suited for shovel handles and axe handles. 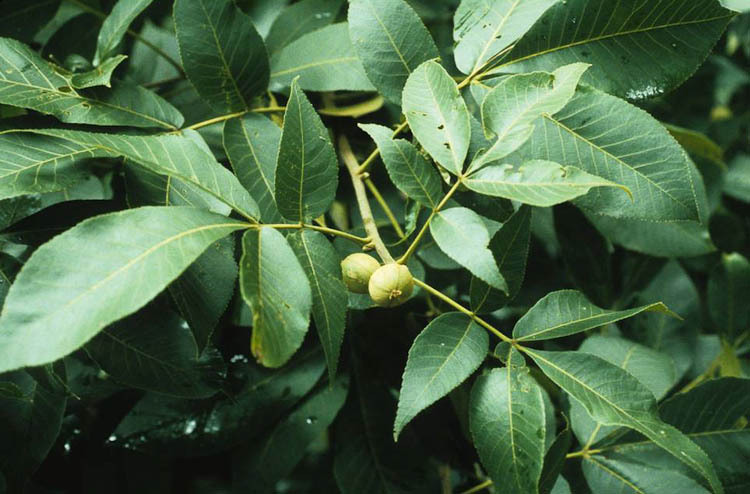 Bitternut hickory has alternate, pinnately compund leaves. Hickory nuts are edible, and thick-hulled. 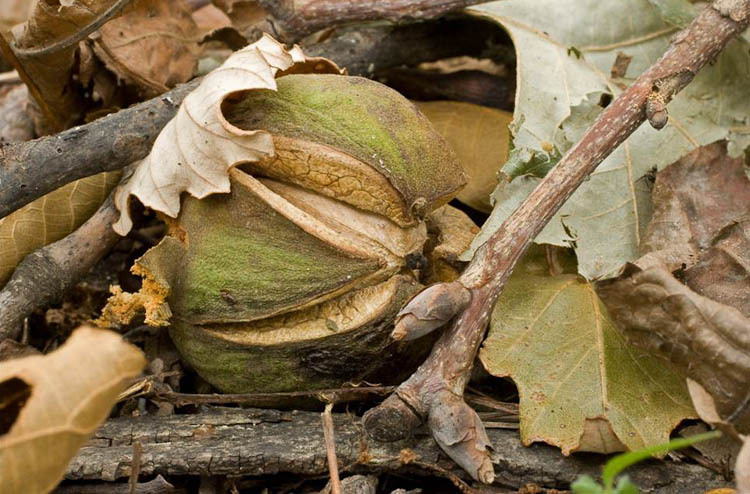 They were used by native Americans to thicken stews, and to make a fermented drink, and to produce an oil that some early writer said soothed “Dolors and gripes of the belly.” The pecan is a hickory (Carya illinoinensis). 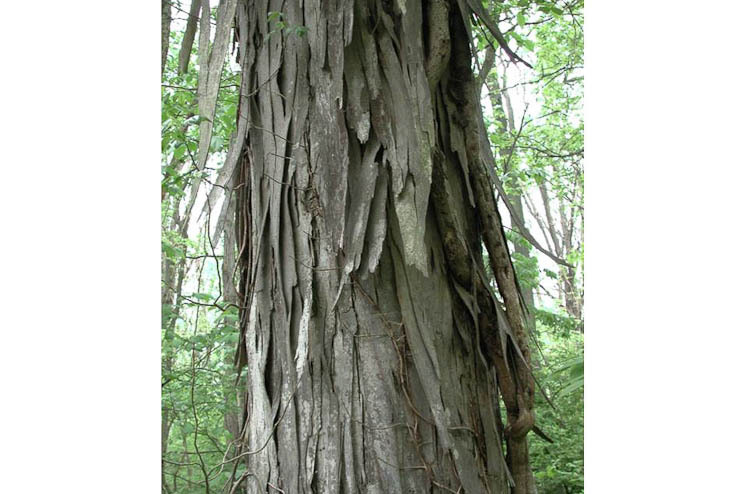 Shagbark hickory has shaggy bark. Like many forest trees, members of the genus Carya are monoecious, i.e., they produce unisexual flowers (either male or female) and both types are found on the same tree. 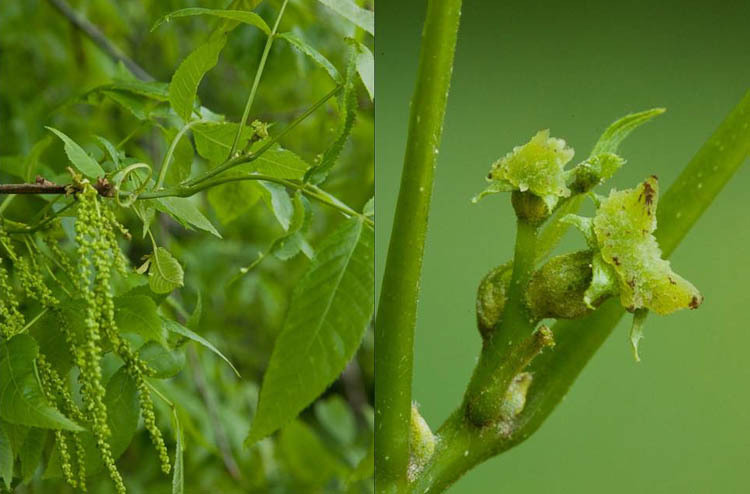 Moreover., the male flowers are tiny and disposed along an elongate drooping catkin, while the female ones are much les numerous, and relatively large. 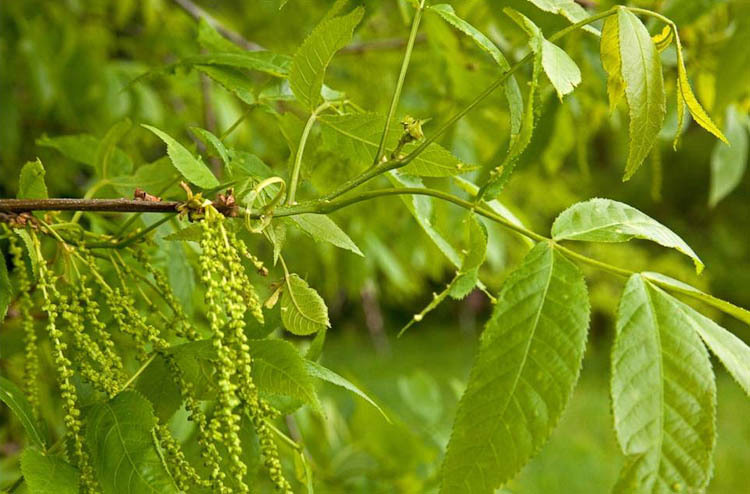 Here’s a flowering branch of bitternut hickory (Carya cordiformis). Bitternut hickory branch showing male flowers in catkins, female at branch tip. Here’s a closer view of the bitternut hickory flowers. Bitternut hickory flowers. Left: staminate (male). Right: pistillate (female). Hickory wood is not only especially hard, but it can withstand sudden shocks. For this reason, is is used for axe handles and, formerly, was used for automobile wheel spokes. Someone actually posted a video on YouTube of hickory catkins releasing a cloud of yellow pollen when the branch is shaken, to rockin’ musical (?) accompaniment. Scary video of hickory pollen and guitar players.